The repetitive lamenting about the loss of our homeland, the turmoil and despair brought about by partition, the post partition struggle the community encountered, at every congregation of the Sindhi community, has become monotonous and uninteresting to the post partition generation. • For how long will we keep wallowing in self-pity at the loss of our homeland? • For how long will we keep harping on the misfortune and sufferings we had to endure? • For how long will we keep moaning about the lack of assistance and help from the powers that be? Surely five decades has been long enough! Let us stop looking back – yes, we went through hell but, NOW WHAT!! I feel the theme of our song should now be “Let’s get on with it and let’s get cracking”. What next, what now is the need of the hour? This is what we at Sindhishaan intend asking our torch bearers and the younger generation in the coming few months, and with the feedback received, formulate an action plan – to link all our brethren scattered all over the globe into a cohesive front and evolve a strategy to further our cause. 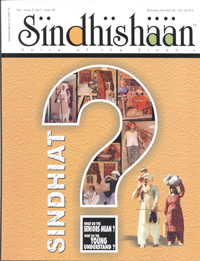 Why don’t you come back with your response on this subject to Sindhishaan.